This interview took place on: 5/11/14. JFH (John "Flip" Choquette): First of all, thank you for your time. I know for a lot of us stateside, your recent release, In a Breath, was really a introduction of sorts to what you've been doing. You've been around a lot longer than that though. For the uninformed, just give us a little background of how the band came together. Were you guys friends beforehand? How did everything come about? Kyle Lane: Thank you for having us!!! It is true that we've been around for a while. 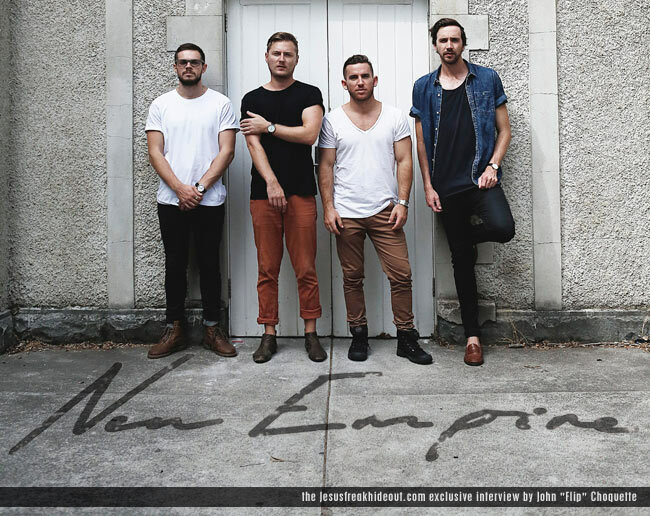 New Empire has been a band for about 6 years now with a couple of lineup changes in between. The two original members, Jeremy and Kale, grew up together actually. They played soccer together as young boys and went all through school together playing in bands. Then I came along when I was in early high school as a fan boy and ended up going on the road with the band as their Tech, until a position opened up for me to grab an instrument. Our newest member, Nate, has been friends with us for many years through friend circles. We are all very close friends which makes band life super easy. JFH (Flip): That's awesome. It sounds like things really came together! Just looking at your list of accomplishments, the festivals you've played, the types of bands you've shared the stage with, you've already had such a storied career. In 2012, your song, 'One Heart/Million Voices,' was selected as the official theme song for the 2012 Summer Olympic Games on Australian TV. What was that experience like and did it lead to any opportunities that you wouldn't have expected? Kyle: This was an amazing opportunity for us. At the time it really felt like the start of something big. I think the best thing that came out of it was the opportunity for people to hear a song that is so close to our hearts, and to be able to play it at shows and people sing it back to you. It's quite incredible. JFH (Flip): I can imagine! You've been around for 6 years, but you're just now breaking into the United States. At what point did you know that you had the ability to make an impact, not just nationally, but internationally as well? Did you always envision yourselves as a local band, or did you have bigger aspirations from the start? Kyle: From the start, this band has always been a bigger picture group of guys. We always knew that at some point we would start touring the States and beyond. In our heads, we knew that we had something to say that was bigger than just Australia, and if we were to limit ourselves to our country, we would be limiting ourselves in terms of how many people could be reached with this message. JFH (Flip): For sure. Your latest album, In a Breath, came out on April 29th through Tooth & Nail Records. How did you first get involved with them? Did the label approach you, or did you reach out to them? Describe the process and the decision-making behind this partnership. Kyle: The way I remember it is that we had sent the album to them, as we did with many other labels. What we heard back was that Tooth and Nail loved it and wanted to have a chat on Skype. When we met with them, they were so excited about our record and so excited about us as people. It felt like there was a genuine care and enthusiasm to see us succeed in the States, which we didn't see in any other labels. This is what really got us over the edge. JFH (Flip): That's great. Now that you're breaking into the States, what would you say your biggest challenge is in reaching a new audience? Have you found that the American market is similar to what you're used to, or different? And how so? Kyle: I think our biggest challenge is capturing people's attention through our live show. The crowds actually are a bit different in the States. I think they are always looking to be impressed as they are so saturated with incredible music. Our aim is to capture their attention through our lyrics, our energy, our passion, our love for people and what we do. JFH (Flip): Your album does a really good job with that, so I'm sure your show does as well. Is there any aspect of American culture that you really love? A certain television show or sports team? Kyle: Me personally, I love the NBA and Hot Wings. I think that sums it up pretty well. JFH (Flip): I'm a fan of the NBA as well. I won't say which team, just that we achieved the worst record in the history of the NBA in 2011-2012. Those were dark days! Ultimately though, you're not trying to reach Americans, or Australians, you're trying to reach people. What do you hope to accomplish through your latest release? Is there a central message, or theme, that you want people to remember, and what lasting impact do you want it to have ten years down the road? Kyle: For us this album is extremely personal. We went through a lot in the process of this album, from losing loved ones to relationship breakdowns. The title track for the record, "In A Breath," speaks of the eternal aspect of loss. That even though someone is no longer a physical part of your life, there is still hope that you will see them again and that time is only in a breath. We hope that people can take this away and realize the hope that can be found through hard situations. JFH (Flip): Absolutely. These themes are very evident. When you set out to write a song, are you thinking of the bigger picture, or is it just the inspiration of the moment? What motivates you to do what you do and write what you write? Kyle: Our singer, Jeremy, is our main song writer, but I know by the way he writes and what he sings about that there is always a bigger picture behind what we sing. I know that we are all motivated by relationships and interactions with people. People shape our character, people shape who we are. It's in those times that the greatest realizations about ourselves are found. That's what we sing about. JFH (Flip): Your new album is very strong both lyrically and musically. Did you ever encounter a time, maybe as a band, or individually, where you found yourself questioning what you believe in? If so, what changed your mind? Kyle: We question almost everything in our lives, as a band as well as personally. I think that's part of being human... but the one thing that we never really question at all is what we believe in and the reason that we are playing music. It is one thing that has always kept us unified and continues to push in the direction we want to be going. JFH (Flip): It must be great to interact with so many different people, both bands and fans. Is there anything that you've learned from someone you've played with that has made an impact on your faith, or the way you approach your ministry? Kyle: The one band that has been absolutely instrumental in us as a band, as well as us as men, is For Today. Every time we get to hang out with those guys, we are pushed to be better at everything we do and everything that we are. Those guys are living lives that are so sold out on a vision, to the point that they would die for it. That inspires us and pushes us to be the same. JFH (Flip): I had the privilege of reviewing their latest album, Fight the Silence, for JFH earlier this year. It was my first time being exposed to the band, but I have to say that I came away impressed. I certainly wish the same type of influence for you guys going forward. I think you definitely have the ability to reach a lot of different people. Anything else you want to say to all the JFH readers out there? I really appreciate you taking the time to talk with us. Thank you again, and best of luck with everything moving forward! Kyle: Come and see us on one of our American dates and keep listening to music that impacts you. Thanks for having us! New Empire's latest album, In A Breath is available now wherever music is sold!